There are certain recipes that take you back to your childhood. 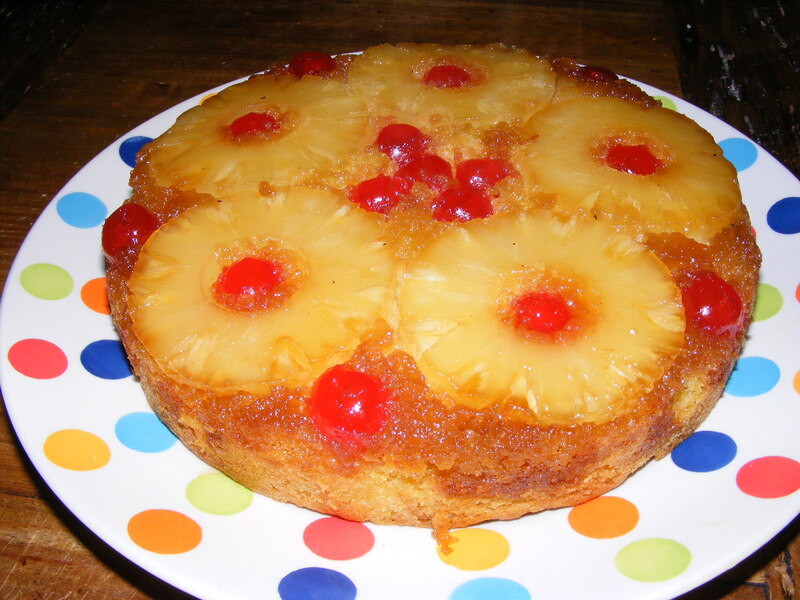 Now, whilst pineapple upside down cake is not really one of my childhood recipes, it is one of my sister’s. There is an 8 year age gap between me and Naomi so she spent a lot of time with me when she was little due to Mum being a nurse and working long shifts. One of my sister’s favourite past-times was “helping” me in the kitchen. I say helping but that is being kind, hindering may be a more accurate description! She used to drop eggs over the floor, knock the flour everywhere and generally cause chaos but I love her anyway! Another of my sister’s little foibles, when she was younger, was her aversion to custard! She flat-blank refused to try it! Why I hear you ask? Because it was yellow and sounded like mustard which she had a pathological fear of! This fear was due to the fact that like many children, Naomi went through a phase of biting when she was about 2 years old. Mum punished her by putting mustard on her tongue! I am glad to say that she has finally grown out of both biting and avoiding custard which is a good job because this upside down cake is glorious warm and served with custard. Arrange the pineapples and cherries in the tin. Bake for 30-45 min or until golden brown and passes the skewer test. Allow to cool in the tin for 5-10 minutes. Place a serving plate on top of the tin then carefully invert it. Remove the tin and baking parchment.